Pakistan President Pervez Musharraf has offered to open the Line of Control (LoC) dividing Kashmir to help families find loved ones after the earthquake. "We will allow any amount of people coming across... to meet relatives and assist with reconstruction," he said. He was speaking in Muzaffarabad in Pakistan-administered Kashmir. India welcomed the plan, saying it backed greater movement across the LoC. Both sides are to improve phone links to allow Kashmiris to call relatives. More than 40,000 people are confirmed dead in the 8 October earthquake, most of them in Kashmir. India and Pakistan both claim Kashmir and have fought two wars over it since independence, but began peace talks last year. 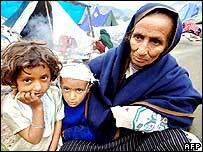 Meanwhile, Pakistan has banned the export of tents as relief teams struggle to provide shelter for quake victims, particularly those stranded in remote mountain valleys. An estimated 1.5m tents are required. The United Nations says about 500,000 people have yet to see any help. It has so far received just 5% of the money it says it needs to fund its relief operation - about $13m has arrived following an emergency appeal for $272m, with a further $50m promised. President Musharraf's proposal - after touring the ruins of Muzaffarabad, close to the epicentre of the quake - was the latest in a series of initiatives that have arisen from the earthquake disaster. Kashmiris, he said, should be able to cross at points other than the road between Srinagar on the Indian side and Muzaffarabad on the Pakistani side, the existing transit route in the region. "If India agrees, we would like to work out the formalities." 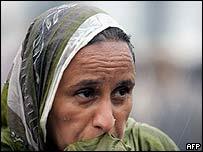 As far as aid went, Gen Musharraf said he hoped that people would receive most of what they need within two to three weeks. He proposed that political leaders on both sides should interact to "assist each other with the reconstruction efforts". The BBC's Aamer Ahmed Khan in Karachi says that opening up the Line of Control could make a huge difference to the relief effort. Our correspondent says that in Kashmir and elsewhere in Pakistan there has been much anger directed at President Musharraf's government after an Indian offer to deliver aid in Indian helicopters foundered because Pakistan insisted on the pilots being Pakistani. India, which has flown several planeloads of relief to Pakistan, was swift to welcome Gen Musharraf's proposal. "This is in line with India's advocacy of greater movement across the LoC for relief work and closer people-to-people contacts," foreign ministry spokesman Navtej Sarna. "India is willing to facilitate such movements but we await word from Pakistan about the practical details of implementing this intention." India says that on Monday it offered to supply medicines and other materials directly across the Line of Control in areas where Indian troops could get to quake victims more easily than Pakistani troops. Earlier on Tuesday, the UN's World Food Programme (WFP) said it was facing one of the toughest challenges it had ever faced - and time was running out for survivors. "The aid agencies have managed to give some help to hundreds of thousands of people," WFP executive director James Morris said. "But there are an estimated half a million more people out there in desperate need, who no one has managed to reach." According to the UN, more than three million people have been left homeless. Pakistan says it needs thousands of special winterised tents from abroad to house families living in the open. Improved weather on Tuesday meant that helicopters resumed operations in Pakistan-administered Kashmir. Soldiers used mules to reach victims living in steep villages along some of the region's remote valleys where no medical help is available. A doctor in the town of Balakot in North West Frontier Province told the BBC that an eight-year-old girl was brought to his medical team 10 ten days after the quake. He said she was severely dehydrated and unconscious. She had been trapped under rubble and given up for dead, the doctor said. But later, when the rubble was being cleared, she was found. Aid agencies and correspondents say the need for more helicopters remains the most urgent priority in Pakistan-administered Kashmir. Local officials in Pakistan-controlled Kashmir say the toll may be as high as 54,000. In Indian-administered Kashmir, officials say 1,400 people were killed.